This oversized item has special shipping requirements. Additional shipping charges may apply for this item for certain shipping methods. Professional stage piano with graded-hammer wooden keybed. The MP11SE utilizes Kawai’s highly-regarded Grand Feel wooden-key keyboard action, which draws upon 90 years of acoustic piano craftsmanship to provide an exceptionally realistic playing experience. As with a grand piano, all eighty-eight black and white keys are crafted from long pieces of wood, pivoting on a central balance pin in a smooth, seesaw-like motion. 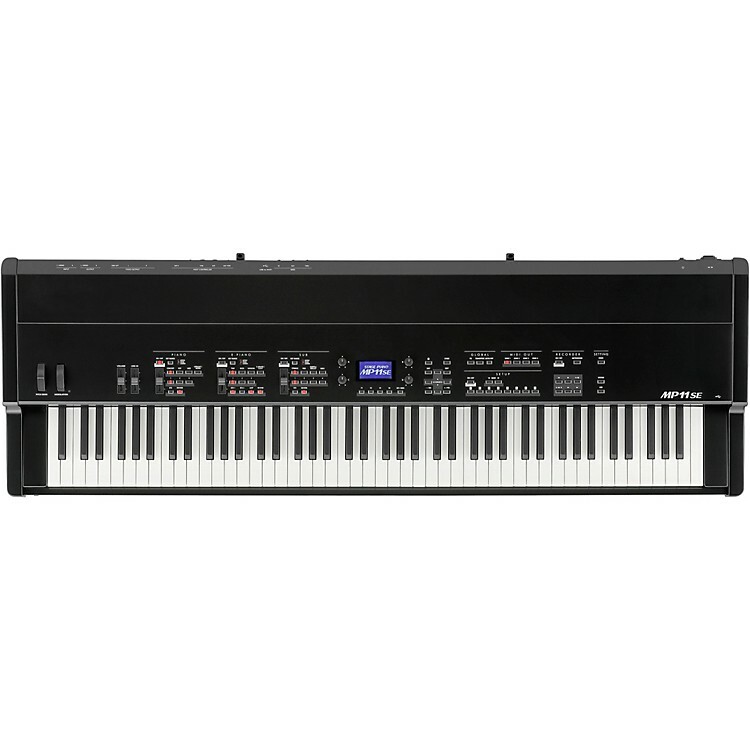 The Grand Feel keys are longer than any other digital piano keyboard action, with the pivot point distance extended to match that of a Kawai grand piano. When the front of a key is pressed down, the rear rises, throwing a hammer which plays the note. These hammers are graded in size and weight, replicating the heavier bass and lighter treble notes of an acoustic grand piano, while additional counter-weights embedded within the lower keys help to lighten their touch during pianissimo passages. The Grand Feel keyboard action even reproduces the subtle let-off sensation felt when playing the keys of a grand piano very softly, satisfying the expectations of even the most discerning pianists. Finally, the Grand Feel keyboard action features Kawai’s Ivory Touch key surfaces as standard. This finely textured material gently absorbs moisture to assist playing control, and possesses a natural, matte finish that is smooth, but not slippery. The MP11SE captures the beautiful sound of Kawai’s SK-EX, EX, and SK-5 acoustic grand pianos, with all 88 keys of these exceptional instruments meticulously recorded, analyzed and faithfully reproduced using proprietary Harmonic Imaging™ technology. This unique process accurately recreates the broad dynamic range of the original grand pianos, affording pianists an extraordinary level of expressiveness ranging from the softest pianissimo to the strongest, boldest fortissimo. With separate categories for Concert, Pop, and Jazz playing, the MP11SE offers the finest selection of high quality acoustic piano sounds ever compiled for a Kawai instrument, with a separate category devoted entirely to upright and mono pianos. Moreover, Kawai’s unique Virtual Technician feature allows various characteristics of the selected acoustic piano sound to be shaped at the touch of a button or the turn of a knob, with parameters to adjust voicing and regulation, string and damper resonances, and subtle hammer, damper, and key release noises. The MP11SE features a selection of incredible vintage electric piano sounds, each with their own distinctive characteristics. Enjoy their natural, organic sound, or pass the signal through a wide variety of classic effects stomp boxes, before plugging into one of the five classic amp and speaker cabinets – complete with realistic microphone character and position modelling. The MP11SE features a new, improved MIDI OUT section with four independent zones for controlling external devices, or integrating into the studio as a master keyboard. Use the assignable panel knobs to send CC# to connected hardware, or the recorder transport buttons to control a DAW without touching a mouse or leaving the piano. The MP11SE even includes LINE IN jacks and a dedicated panel fader to adjust the level of connected devices, such as that old expander module or semi-weighted synth that you just can’t live without, or a laptop running software instruments. The MP11SE’s control panel is clearly arranged and easy to use, with related functions grouped together and placed where you’d expect to find them. A large LCD display and four assignable control knobs, allow several parameters to be adjusted directly in real-time, without getting lost in menus – concentrate on playing, rather than trying to remember which button does what. Discover the authentic feel and sound of the MP11SE!